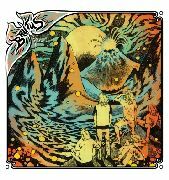 BRUTUS are a Scandinavian quintet - part Swedish, part Norwegian - that subscribes to the Witchcraft school of throwback hard rock. According to the band, inspiration is drawn from (amongst others) Blue Cheer, Sabbath, Pentagram, and Grand Funk Railroad. In other words: butterfingered, groovy, and psychedelic hard rock! BRUTUS' Behind the Mountains is the band's first album for SVART RECORDS, and second overall. Comments the band: "Behind the Mountains was recorded in various parts over a long period, so it took a while to get ready. But we are really happy with our second album, so it was all worth it. The songs were recorded in Subsonic Society here in Oslo, the same studio that we used for the split EP with Graviators. For mastering and mixing, we used Micke Nilson and Henryk Lipp from Music-a-Matic studio in Gothenburg - same guys we worked with for the debut LP. Now we just want to put it out for everyone to enjoy it as we do. You can start with the first single Personal Riot right away!"